The “Lutherstube”, located in the Hotel “Eisenacher Hof” realistically reflects the era of the reformation. As in medieval times, up to 170 guests can enjoy music, juggling and jests. 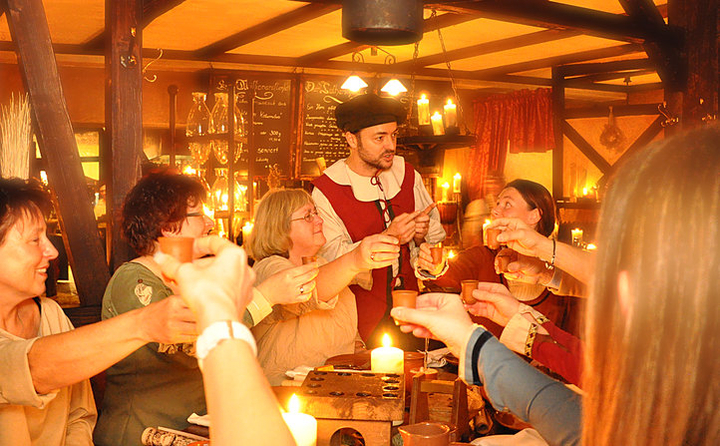 Hundreds of candles, straw on the floor, meter long shish kebabs, courtly dances and historical speeches before and after dinner allow you to relive the time of the Reformer Martin Luther. In medieval costumes, maids and servants await your visit. Awaiting at the entrance near a cozy fireplace is a “round table” with room for sixteen occupants. Likewise, there is rustic “grilling” in the “Schankstube” with an open grill. Here, up to 18 visitors can cook their own meat on a manual rotisserie, from wild boar to a suckling pig. In addition to the dining room with its “herbal garden”, the “banquet room” with its adjoining wine bar invites you to enjoy a cozy dinner. 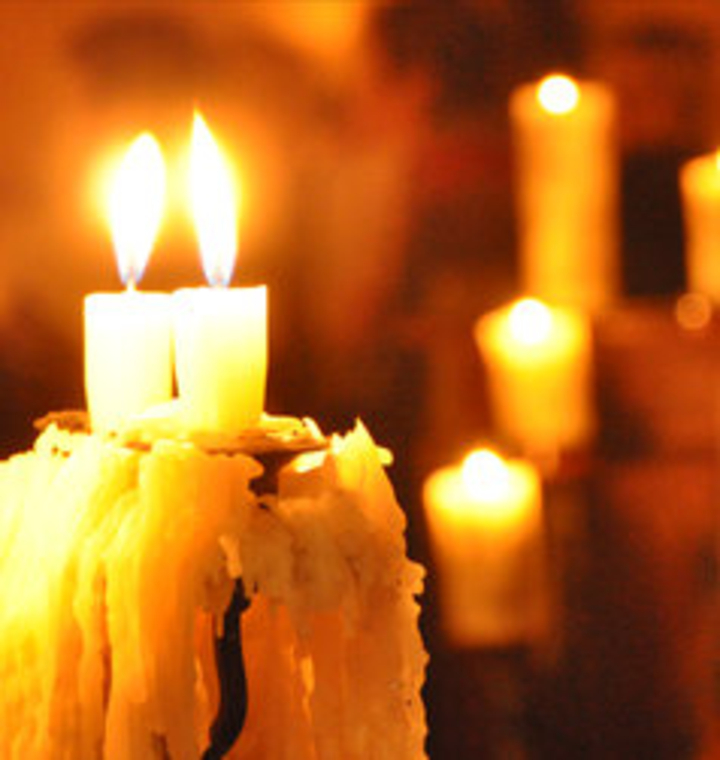 Flickering candlelight envelops the room with its mysterious light. Hanging from the ceiling, huge wagon wheels cast their shadows across dark wooden tables where a hungry group awaits Luther and others. drink-maid Carola and all of the other maids and servants that will tend to your needs during the next few hours while they wear historical costumes to help you into an exciting journey into the late Middle Ages where it is usual to abundantly filled tables. 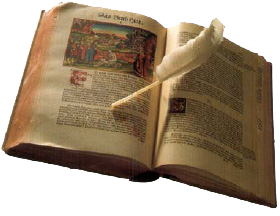 Uther of Katherinenberg has finished his speech, expectantly the guests stomp their feet on the stray covered floors and make a toast and laugh out loud in expectance of a wonderful and entertaining evening. In the “Lutherstuben” in the hotel “Eisenacher Hof” is where you may enjoy the “Luther feast”. First you will be greeted with an apple-liquor, then a white linen bib should be placed around the neck because it is known that your hands are for eating, a drink and a pray will round off the beginning of the feast. 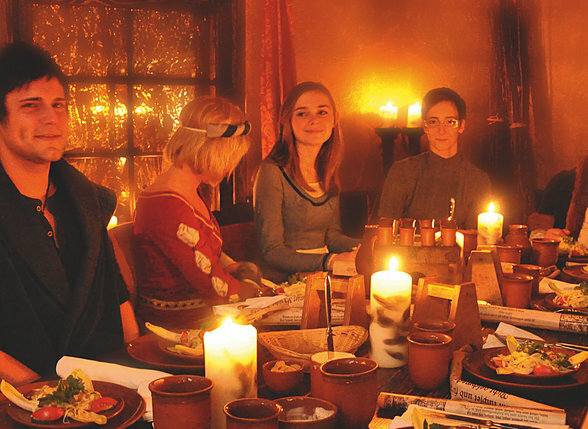 Uther has now blessed you in the most beautiful medieval German, now it is time for maids and servant to tend to your needs by bringing the freshly prepared meal from Kunibert´s open show kitchen. The Met a wonderful honey-wine may now flow out of the horn, beer and wine in clay tumblers are now filled, seasoned lard, herb cheese, meat and potato soup, with yard-long skewers of succulent pieces of meat are now presented, potatoes, bread dumplings, fried onions and chicken, with mushrooms and herbs and of course dessert has not been forgotten a skewered yard of flambéed fruit and an baked apple in vanille/cinnamon sauce. Another round of toasts and it is time for Luther to present s his table readings. “Why rülpset and furzet you do not, it do not geschmecket?”, Will be asked, when the meal is ended. Laughs around the table and claps and calls for the drink servant: “Met, bring more Met!” The mood is growing, Carola calls for a dance on the tables, the guest are now the orchestra, we must add one point, any musician that plays out of tune is subject to punishment by being whipped over the barrel. This is what awaits you in the Small Luther Play which is on every first Sunday of the month but also in the Large Luther Play you will find all of the above plus (upon request) Katharina von Bora, Mealchthon, and Hallodri the musician.